A new Instrument for the Rapid and Accurate Determination of the Viscous Properties of Newtonian and Non-Newtonian Fluids at High Pressures. 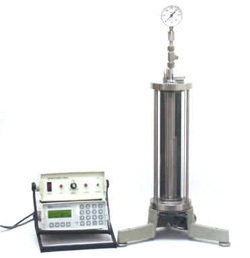 The High Pressure High Temperature Viscometer (HPHTV) consists of a metal needle with hemispherical ends falling vertically in a fluid with its longitudinal axis along the axis of a cylindrical container. A measurement of the needle terminal velocity allows a determination of the viscous properties of the test fluid. With the HPHTV the needle falling time is measured automatically by means of Hall sensors and a magnet in the needle.